Power output function includes AC and AC+DC main modes. Each mode can be combined with one of the signal sources, including internal, external, internal + external, and external synchronization, to provide a strong tool for the generation of a power source with abnormal variations. Arbitrary waveforms can be edited on the PC and transferred via USB interface to APS-1102 as the internal signal source for power output. 16 sets of waveform memory with 4k words waveform length each are available for arbitrary waveform generation and storage. The APS-1 102 can be used as an amplifier for the external signal to generate output power source. When one selects the external signal source mode (AC-EXT or AC+DC-EXT) and connects the external signal to the external signal input/external sync signal input terminal (EXT SIG IN/EXT SYNC IN), APS-1102 generate the power output according to the waveform of the external signal input. 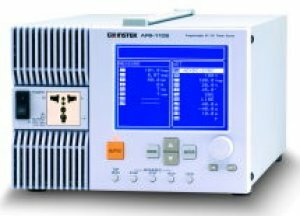 The externally synchronized oscillation of APS-1102 allows the output power source to be frequency-synchronized with the external signal at TTL level in the frequency range from 40Hz to 500Hz. In the Sequence Operation programming, DC, sine waves, square waves, and 16 arbitrary waveforms captured via the USB interface can be used as elements for sequence editing. Among the total 255 sequence steps, as maximum capacity, the waveform, level and time duration can be set; constant / keep / sweep can be chosen in each individual step. The APS-1102 is also equipped with other functions, such as branching to a specified step during a sequence operation. All the data of start, stop, or hold of sequence operation are saved into the sequence memory to perform the sequence operation automatically. Used as the power source for relay and switch characteristic testing. An electronic device containing a capacitor type rectifier, an inrush current, which is larger than the rated current of the device, may flow through the power line immediately after the device is turned on. APS-1102, with peak current hold capability, is able to measure this short time inrush current. On the other hand, the large inrush current flows through the power line may cause the voltage drop, so the electronic device should be able to limit this effect to a certain extent. APS-1102 can supply four times as large peak current as the rated current to support this test. The output current can be limited by setting the maximum output current (peak/average current) in advance, so the prototypes can be protected from abnormal current damage during development evaluation. However, to measure the inrush current of a completed product, the peak current limiter should be set at the maximum value to get a correct measurement result. Switching power sources are widely used in both consumer and industrial electrical products in today’s market. With the capacitor type rectifier, the switching power source has its disadvantages using an input AC source carrying significant amount of harmonic current. When a large amount of harmonic current flows through the power source line, the switching power supply in the device may experience operation faults caused by the voltage distortion, leading to transformer overheat and possibly resulting in a hazardous accident. APS-1102 includes a harmonic current measuring function, which can be performed under AC-INT mode at the fundamental wave setting (panel frequency setting) of either 50 Hz or 60 Hz. Absolute values of harmonic current in RMS and the harmonic to fundamental ratios up to the 40th harmonics ( 2 kHz at 50 Hz fundamental) can be measured and displayed. In the general environment, the input source of DC to DC converter couldn't be a perfect DC. It may contain some AC ripples riding on a DC source due to the sample rectifier and filtering circuit used in the consumer products. AC+DC source is used as the simulation of input power to do the characteristic verification of DC to DC converter. Ideally the voltage flows through transformer should be a pure AC; however, in the general environment, it may also contain a DC component, which may cause magnetic saturation of the transformer and therefore reduce its efficiency. AC+DC source is the simulation of such power environment. The main function of a capacitor is to block the DC voltage and connect the AC voltage in most of the circuits. The DC voltage imposed on the Capacitor, however, will generate extra heat and gradually degrade the function of the capacitor. AC+DC source could be used to test the durability and reliability of a capacitor. APS-1102 provides various types of power source that suits the application of the formation of LCD panel in the manufacturing process. The power source could be AC or AC+DC at various levels of output. Formation is an important process to format the liquid crystal cells inside the panel, so the polarity of the crystal cells could be well-arranged to become functional.